No entrepreneur in history ever became one simply because he was a born leader. Entrepreneurship is not a talent, but a discipline that is forged through years of consistent work on weaknesses and development of strengths. Entrepreneurship is influence and you cannot learn to be an entrepreneur until you learn to be enterprising yourself. So, the challenge here is simple: how to learn to be enterprising. One of the best ways to do this is by reading. “Selling is the art of persuasion where you utilise your individual talents to convince someone to buy the product or service you offer. Marketing, however, is a much more inclusive term which means understanding the customer’s business and putting together a solution to his problems, thereby increasing his productivity,” says Francis G. “Buck” Rogers in The Greatest Salespersons… What They Say About Selling. Well, folks there you have it. No matter how it is explained, sales and marketing are like two peas in a pod. They are brother and sister, and for all I care, they could very well be a pair of twin, the ying-yang of an association that facilitates both means. In conclusion, Peter Kusterer sums it up very well for us when he says that marketing creates opportunities, while sales brings about outcomes. Now, over to you! What is your understanding of the difference between marketing and sales? 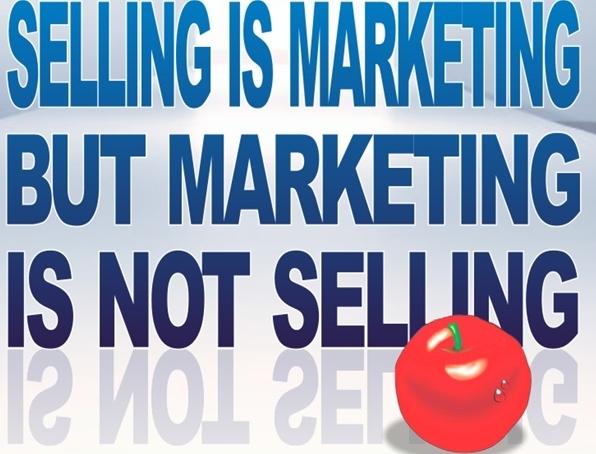 Do you have a better definition of marketing versus sales? If so, I invite you to please share it with us. If you got something to add here, please, we welcome it too. ← My Spanish Town: Delroy A. Whyte-Hall – ThePRwriter!